NMA Weekly Charts indicating long term buy signal in weekly charts since last week. 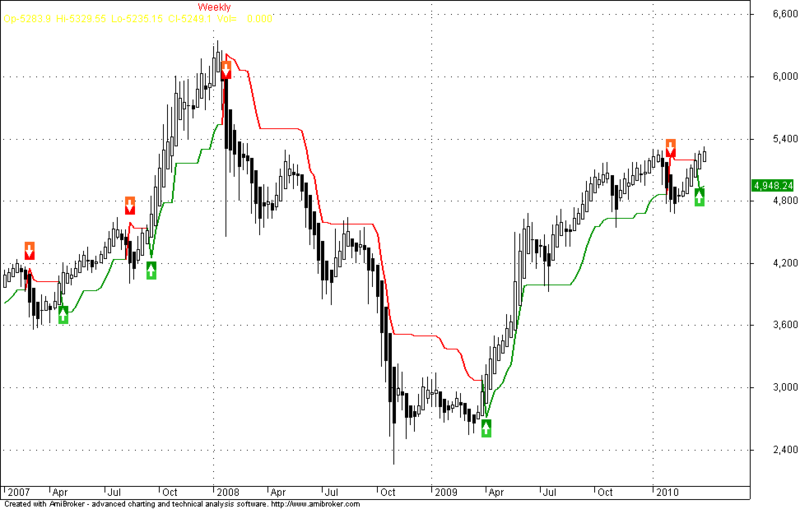 Pls also check if v use k=5 & atr=20 in Hourly chart. In this we will have minimum of 80 points in every trade. + " at barindex: " + aHPivIdxs[k] + ", "
" -- " + Date() +" -- "+"
"Cl-"+C+" "+ "Vol= "+ WriteVal(V)+"
WriteIf (Sell , " EXIT LONG / Reverse Signal at "+C+" ","")+"
WriteIf(shrt AND NOT Sell, "Trade : Short -- Entry price Rs. "+(SellPrice),"")+"
Could u pls send this afl as file attachment to my e-mail id at bhardwaj727@gmail.com. It is showing some errors. Thanx in advance. Dear sandhu348, I`m also getting error in my AB 5.29. It says : error 31. Syntex error, expecting ‘)’ or ‘,’. Please post a solution or the afl. Could u pls send this afl as file attachment to my e-mail id at mihirkumarshah@gmail.com. It is showing some errors in the pivot section . Thanx in advance. Want to try ur AFL but contains lot of errors. Can u please rectify and repost..
" – " + Date() +" – "+"
WriteIf(shrt AND NOT Sell, "Trade : Short – Entry price Rs. "+(SellPrice),"")+"
I am using NMA signals. 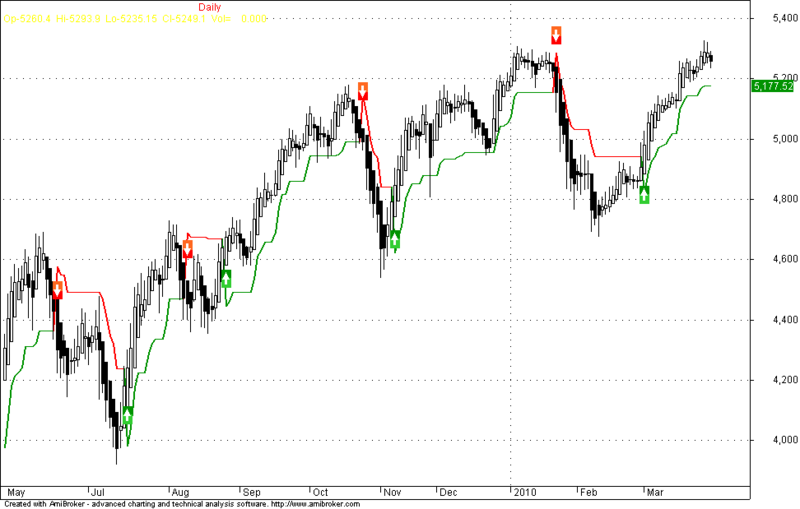 It is working fine and getting maximum points in nifty , my settings are ATR=4 and K=1 . Chances of whipsaws r more but that is OK for me . Rajandran NMA AFL codes seems to be bugged. Can you please send mail (sandyorg123@gmail.com) or update the code afresh in your website?